Flying termites are often mistaken for flying ants, and vice versa. Both insects look very much alike, however flying termites have only two body segments; flying ants have three body segments. Flying termites and flying ants are both equipped with two sets of wings, however the termites’ wings are all equally sized, while flying ants have one set of large wings and one set of smaller wings. Sometimes flying termites, which are also known as swarmers, can be seen flying through the air in search of a site to colonize; sometimes they can be seen feeding in dark, moist areas where they have access to wood. More often though, you’ll realize you’ve got a problem on your hands when you find cast-off wings. Once these destructive insects locate a new home and start to settle in, they mate. Once they have mated, they drop their wings. The location of the wings will sometimes vary depending on the species; if you’re dealing with drywood termites, you are likely to find wings on windowsills or near baseboards, though it is possible to find wings in other locations. 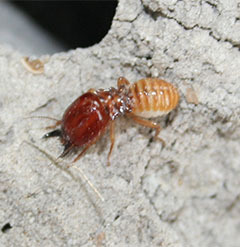 If you’re dealing with subterranean termites or Formosan termites, you are most likely to find wings in dark, damp places; cracks in your home’s foundation, underneath outside siding, and near mud tubs the termites have built to lay their eggs are all places where flying termites tend to shed their wings. If you’re lucky enough to see flying termites before they shed their wings and invade your home, you can kill them easily, just like you can kill any other insect. Flying termites can be attracted with a bug zapper, they can be smacked with a flyswatter, or they can be vacuumed up. If you don’t mind pesticide, you can use a liquid bug spray to eliminate them. Unfortunately, flying termites are often a sign that there is an active breeding colony nearby. Depending on your location, the presence of swarmers could indicate that you have a larger problem on your hands and the colony is located on your property, or it could mean that someone in your neighborhood has a termite problem. If you believe the main termite colony is located on your property, it’s important that you locate it, evaluate it, and eliminate it before worse damage occurs to your home or other buildings. There are a number of different methods you can use for termite control, which we cover in another article. If you see flying termites, don’t ignore them. Instead, use every method possible for eliminating them to ensure you are able to stop a potential infestation before it becomes serious.